The “Procuenca Initiative” in the Andes region of western Colombia may be the first in the world to sell certified forest carbon credits with a biodiversity protection component. But alarms are sounding about the potential negative social and environmental consequences. Under way since 2001, the programme will begin to operate in the international market next year, having received official registration Apr. 16 under the Clean Development Mechanism (CDM). Part of the Kyoto Protocol on Climate Change, in force since 2005, the CDM allows industrialised countries to earn credits for reducing emissions of greenhouse gases by investing in projects in developing countries that expand their capacity to absorb the carbon emissions. Procuenca is expected to auction credits for some 350,000 tonnes of carbon that has been sequestered since the project began, initiative director Francisco Ocampo told Tierramérica through a translator. At the current market value of 20 dollars per tonne, the total would be 7 million dollars for a struggling community, one that is still suffering from the collapse of coffee prices more than a decade ago. “This project demonstrates the international importance of these forests for carbon storage,” said Ocampo. The additional trees planted absorb carbon dioxide from the atmosphere, retaining it as solid carbon throughout the tree’s life cycle. Procuenca brings benefits to this area: its people and its unique biodiversity, Ocampo added. However, a 2008 study by the Colombian non-governmental organisation Censat Agua Viva, concludes that the project has “significant negative impacts on local communities,” reduces local people’s autonomy and is a poor way to conserve biodiversity. Meanwhile, Conservation International (CI), a project partner, calls Procuenca the “Swiss army knife” of conservation for its multiple benefits. It “demonstrates climate change mitigation efforts can also provide important services such as freshwater protection, biodiversity conservation and human well-being,” according to a press release. So who’s right? Maybe everyone. About 250,000 hectares in the watershed of the Rio Chinchiná, centred on the city of Manizales, are included in the project. Following the collapse of coffee prices in the late 1990s, the mainly small landholders in the region switched to cattle raising, clearing the forest – which led to erosion and hurt water sources in both quality and quantity. In 2001, the municipal officials of Manizales, supported by the United Nations Food and Agriculture Organisation (FAO), launched an ambitious 8.5-million-dollar reforestation and regeneration effort to protect and improve their water supply. “Carbon sequestration was not part of the initial project,” said Mario Mengarelli, FAO forestry officer for Latin America, based in Santiago, Chile. Procuenca was only about economic development for the local farmers and proper management of the watershed, Mengarelli told Tierramérica. 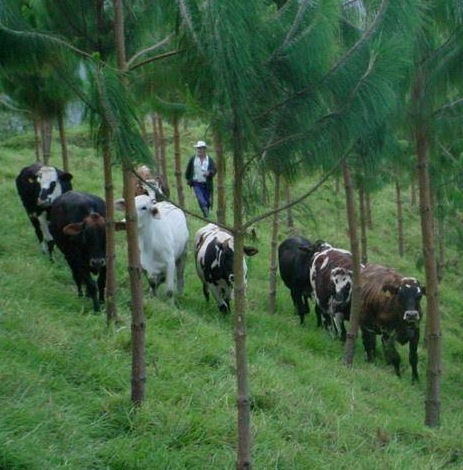 About 4,000 hectares are in plantation forests of pine, although some areas are mixed plantation, with crops and include a large proportion where cattle can graze. There are very few plantations of blocks of trees, none larger than 14 hectares and most less than 10. The 300 local farmers and landowners participating in the initiative decided the locations and often it is not on their best land, said Mengarelli. Over the entire project area is a patchwork of plantations, assisted natural regeneration areas that will act as corridors between remaining forests, areas fenced off from cattle, and plantings of native trees at sites more than 3,000 metres above sea level, he said. “There has been a very positive reaction from the farmers involved,” added the FAO expert. The notion that the nascent carbon market could be a new revenue source for landowners came a little later, according to Mengarelli. A survey by Censat Agua Viva of Procuenca landowners found that some were unhappy and many were concerned about the loss of control over their lands. The CDM has strict rules about how plantations are managed, including what species of trees they can plant or which fertilisers they can use, acknowledged Fabio Arjona, Conservation International director in Colombia. Registering the project under CDM is expensive, and Procuenca is funded through a tariff on Manizales municipal residents’ water bills, Arjona said through a translator. The region is rich in biodiversity, which includes the spectacled bear (Tremarctos ornatus) and yellow-eared parrot (Ognorhynchus icterotis). The opportunity to protect and enhance natural habitat is the reason CI became involved, he said. Seventy percent of the revenue from CDM carbon credits will go to the landowners, 20 percent to a biodiversity trust and 10 percent to Procuenca, Arjona said. An examination of the landowner agreements with Procuenca revealed that some of the lands had been covered by natural forest, according to the 88-page report “Implementation of Compensation Mechanisms for Environmental Services: The Colombian Procuenca Case,” produced by Censat and the Global Forest Coalition. Censat states that of the initial list of eight tree species reported for the reforestation project, just four were native species, and areas that already had rainforest species were then covered with exotic species. Arjona responded that the CDM does not allow the removal of forests for the purposes of creating new plantations and that it uses satellite images to verify the state of the natural forest. “If there was natural forest there in 1990, then those lands cannot receive CDM accreditation,” he said.